AUA is pleased to bring this FREE 60-minute, non-cme online educational series, presented in Spanish to the global urologic community. Dr. Alejandro Rodriguez is joined by expert faculties Drs. 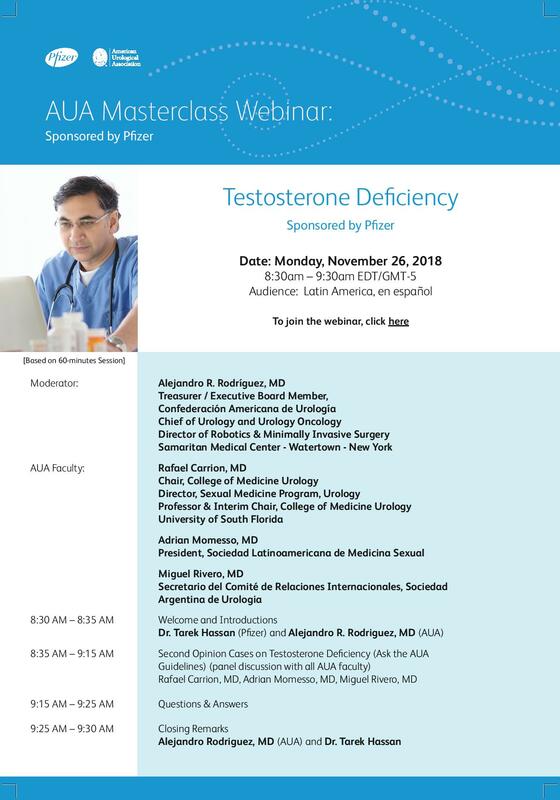 Rafael Carrion, Adrian Momesso and Miguel Rivero for an exciting program featuring didactic lectures from AUA2018 Second Opinion Cases on Testosterone Defiency. This educational series is supported by an independent educational grant from Pfizer Inc.
AUA is pleased to bring this FREE non-cme online educational series to the global urologic community. This 90 minute webinar is presented in Español focusing on the Surgical Treatment of BPH. NOTE: This activity is a non-CME resource. CME is no awarded for this activity. If you have an AUAID, please click on the Take Corse button; otherwise, please access the webinar from the Overview tab.